"Thanks to Occupy Wall Street and the Tea Party, America now has two national protest movements at opposite ends of the ideological spectrum, exemplifying our frenetic political culture. At last, there are diametric outlets for all the angst." However, that focuses more on the similarities of the participants than their ideas. Then we have this from Slate which says "The Venn diagram below plots the concerns, allies, heroes, and inspirations of the two movements." Again that was trying to visualize more then just their ideas but it begins to get closer to the main hot button issues which fueled the rise of both movements. Then there is this venn diagram from James Sinclair and made a little more attractive to the eyes by Ty Mortensen. This hits a lot more on the key issue. "The crash has laid bare many unpleasant truths about the United States. One of the most alarming, says a former chief economist of the International Monetary Fund, is that the finance industry has effectively captured our government"
Putting aside the irony of someone formerly from the IMF talking about corruption (a rant for another day), it goes on to point out a few of the connections at the time (a web that has only grown since). "One channel of influence was, of course, the flow of individuals between Wall Street and Washington. Robert Rubin, once the co-chairman of Goldman Sachs, served in Washington as Treasury secretary under Clinton, and later became chairman of Citigroup’s executive committee. Henry Paulson, CEO of Goldman Sachs during the long boom, became Treasury secretary under George W.Bush. John Snow, Paulson’s predecessor, left to become chairman of Cerberus Capital Management, a large private-equity firm that also counts Dan Quayle among its executives. Alan Greenspan, after leaving the Federal Reserve, became a consultant to Pimco, perhaps the biggest player in international bond markets. These personal connections were multiplied many times over at the lower levels of the past three presidential administrations, strengthening the ties between Washington and Wall Street. It has become something of a tradition for Goldman Sachs employees to go into public service after they leave the firm. The flow of Goldman alumni—including Jon Corzine, now the governor of New Jersey, along with Rubin and Paulson—not only placed people with Wall Street’s worldview in the halls of power; it also helped create an image of Goldman (inside the Beltway, at least) as an institution that was itself almost a form of public service." We all know where Jon Corzine went after being governor...ya corrupt and now defunct MF global. As Dealbook points out about the MF global investigation. "In a more surprising development, Gary Gensler, head of the Commodity Futures Trading Commission, will no longer participate in the investigation due to his long acquaintance with Mr. Corzine"
Take a wild guess where they knew each other from? "Mr. Gensler had worked for Mr. Corzine while both were at Goldman Sachs in the 1990s." Ya, that was a little too easy. However, my point is not to discuss in detail the depth of corporations infiltration of our government and our regulatory agencies. 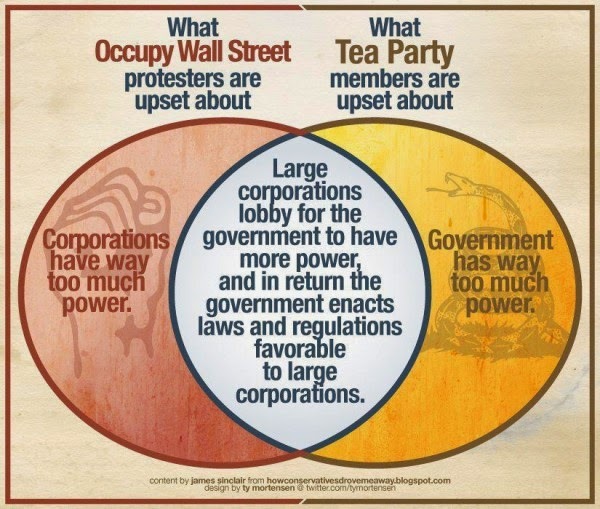 My point is that the corruption and blurring of the lines between corporations and government is at the heart of both OWS and the Tea Party movements. By focusing on their CORE IDEAS the movements together have hope of getting something accomplished. Otherwise it seems their messages will get watered down, twisted by the media, and turned into nothing but expressions of the ideologies of the "left" and "right"....something both movements were expressly against. 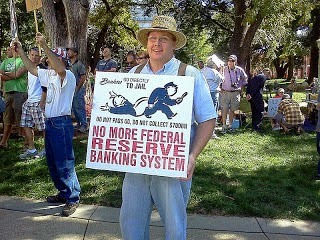 Both movements from the very start focused on the Federal Reserve. Why not start there? 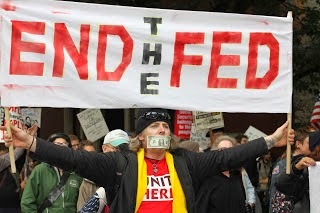 End the Fed. This blog is very impressive and very helpful to everyone that sees it. Thank you.